"Looking for the best, most feature packed, heavy duty power rack in Australia? Own a personal training studio or commercial gym? Train clients or like to train with a partner? This power rack is an absolute beast! Weighing in at 221kg, you won’t find a beastier rack than this! The rack is huge and incorporates barbell, plate, chain and band storage as well as 2 x sets of adjustable safety bars. 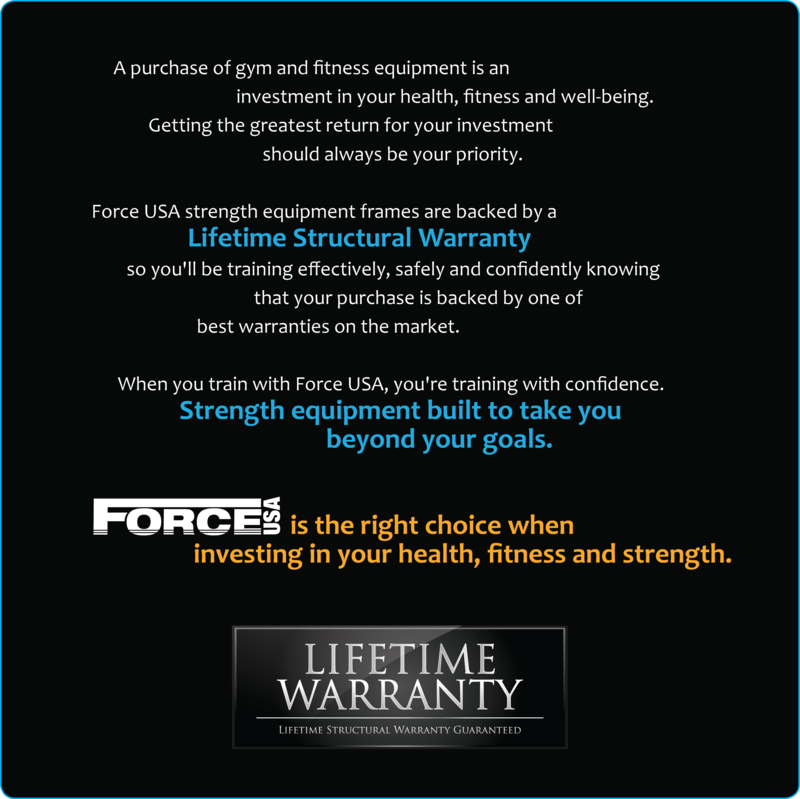 The Force USA Commercial Power Rack is dual-entry, meaning you can enter from the front or side of the rack - perfect for training with a client or partner. Force USA is constantly improving designs to stay ahead of our competition. Images may vary slightly to actual product due to additional enhancements. 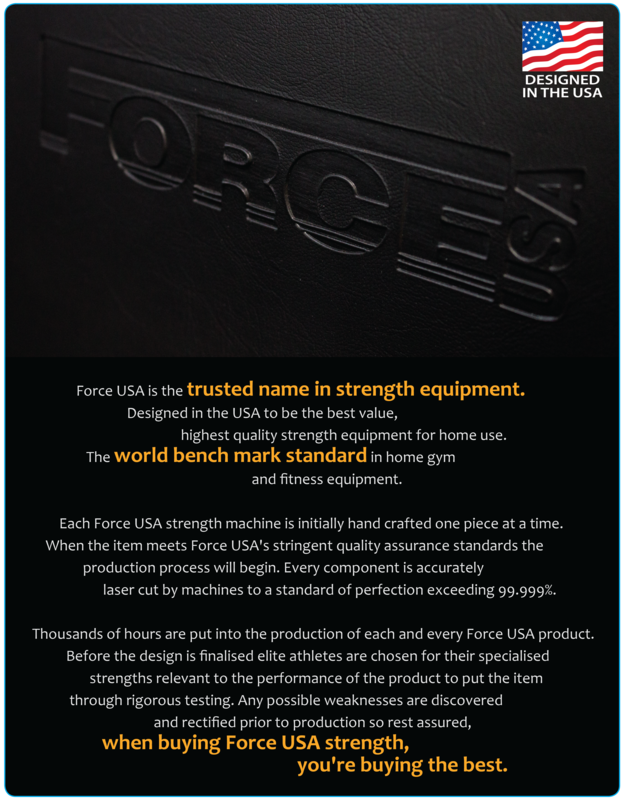 WHY CHOOSE THE FORCE USA COMMERCIAL POWER RACK? Over 221kg so this rack won’t budge an inch! Ideal for studios or commercial environment - even home gyms!! "Looking for the best, most feature packed, heavy duty power rack in Australia?" was their question. My answer was yes, and I got what I want. Undoubtedly, the Force USA Commercial Power Rack is the best equipment I've ever had delivered by Gym and Fitness. This is not to say the other products I purchased from this online store were low quality, because they are most definitely not. It's just that this power rack stands above the rest. I highly recommend this equipment to anyone looking for a high quality and solid machine. Best power rack for my commercial gym. The features are neat and are suited for my clients. Band pegs work well, barbell holders and plate storage a nice addition to the functionality of the power rack. Adjustable safeties are much appreciated as well, along with the j-hooks that make adjustment quicker. Overall, this commercial power rack is a total package and the best thing is I got it for an affordable price. Thanks! When I watched the video and the voice over said this power rack is a beast, it was kinda hard for me to believe. I am a bit skeptical when it comes to advertisements as I feel most are exaggerated. Anyhow, a part of me said it's worth the investment so I took the chance and bought it. I'm so happy I trusted and listened to my instincts. For the first time in my life, a product is exactly as it is advertised. Thanks Gym and Fitness for the help from beginning to end. Kudos. The Force USA commercial power rack made my gym stand out in our humble town. I have observed more customers and clients ever since I made this machine available for use. Powerful machine. The Force USA power rack is my ultimate trainer. Don't need anything or anybody else inside my studio. Thanks Gym and Fitness for the quick service.